This is almost a “No Comment Necessary” article. Take a good look at this US Dollar Index chart and witness the ominous Head-and-Shoulders pattern beginning to show itself. Ironically, the flattening red line of the 50 day moving average slices right through the “head” of the formation - precisely at the neck line. An ominous sign, indeed! Not so much from a technical standpoint, of course, but from a symbolic one. For any chart to form such a picture-perfect H&S pattern after as long and as deep a decline as the dollar has recently had is an absolute anomaly. Normally, this happens when tops have formed after a considerable period of increases. 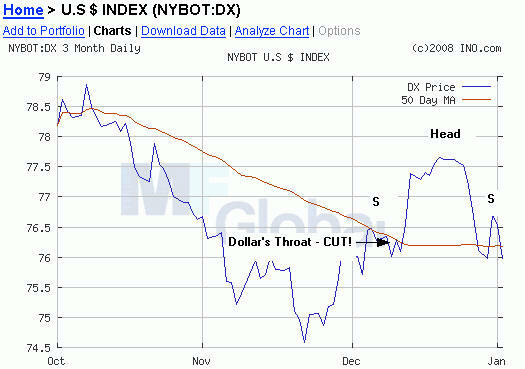 Once the dollar falls below that last support level, nation after nation will stop selling exports for dollars. The dollar will no longer be the reserve currency of the world, but will become a "reverse-currency". Dollar flows out of the US will cease completely - and reverse course. Given the current situation in nuclear-armed Pakistan, the oil price’s near-miss in penetrating the $100/bbl mark (today after actually touching it, and the extent of the widening black credit hole that is engulfing the US financial sector, this can lead to absolutely horrific consequences. While all of this was happening today, gold shot up and blasted right through its historic nominal price ceiling high-point at $850 per ounce - reached in January of 1980. Gold it is still cheap, not only in real terms but even in nominal terms. It still has a long, long way to go before it even comes near its real-terms all time high above $2,000 an ounce and it won't stop there, either. A word of advice to Indian bridegrooms: Buy your gold now while it’s still cheap! You will never see prices this low again. Maybe, if you are lucky, after the usual correction in April/May this year - but when the next wedding season rolls around, you will wish you had heeded these words. Even the recently rather embattled gold stocks shot back up and shattered their own building H&S pattern. There will soon be times when gold stocks will crater despite gold’s continued shuttle launch, but thankfully that time is not here yet. Euro vs Dollar Gold Monitor members will know when it comes, beforehand. Others may not. Today, oil touched $100/bbl; the Dow broke a record for the worst first-of-the-year trading day - ever; ten year treasury note yields dropped below 3.90 percent; the ISM manufacturing index dropped to 47.7 in December - with dropping new orders and while producers are paying higher prices for their raw materials. In the face of all this, CNBC today aired an interview on “Power Lunch” in which the anchor queried a financial-looking “expert” about people's new years resolutions to - lose weight??! That kind of disconnect from reality, of course, goes right in hand with the disconnect that is happening between the dollar and its head on the chart above - so, hey, why not? The Euro vs Dollar effect goes into overdrive as power elites are stocking up on gold bullion in preparation for the gold price’s lift-off into investment orbit. Sure, a few of us 'plebs' are allowed to join their otherwise “members only’ party. Small price to pay for being able to benefit from an arrangement that will leave them the bulk of the earth’s gold wealth. This is happening either through private holdings, sovereign wealth funds, or through the central banks these individuals collectively control. All the while, us regular folks get to spend fiat euros after the severed dollar’s head makes its final roll into the guillotine basket. The Fed, of course, is wisely “keeping its options open” in view of all this. Unfortunately, the options it keeps open consist of two choices that are equally as unpalatable as they are ineffective in preventing the final disaster. Cut, you lose - because inflation roars, and hike, you lose - because a towering recession looms just around the bend. Bernie surely wishes he hadn’t taken the job - while Greenspan chuckles and rubs his palms together. But, not to worry. The president just took firm steps to protect the dollar. He signed a law that put the legend “In God We Trust” from the rim of the phonily gilded one-dollar coin back onto the face, or the obverse. The reason: “experts” said that the legend “might rub off” if it is left on the rim of the coin. Weighty concerns, indeed. Meanwhile, the middle class is getting roiled by the dollar’s loss of buying power as a direct result of official neglect and complicity in decades of debauchement. Don’t get me wrong. I like the phrase to be on there, too - but that presidential flick of the wrist falls just a little bit short of what must be done to protect Americans’ buying power, doesn’t it? Now on the other hand, taking all taxes off from exchanges of gold or silver for goods and services, that might just do the trick. It may not help the dollar, per se, but it will give Americans a way to survive what’s coming - with their country, economy, and wealth position intact. Unfortunately, doing this will take too much power away from our president’s financial handlers, so he will definitely not be the one to push for it. I could probably be accused of “harping” on this issue - but this does bear repeating, over and over, until somebody finally gets it. When was the last time you had a bona-fide candidate for president of the United States, with a huge following and the ability to out-fundraise every other candidate in the last quarter, who actually proposes to restore the very metals we all like to invest in to full legal currency status? Too radical for you? Trust me: it's not as radical as what will happen if he doesn't win and Bush's successor doesn't do what Ron Paul proposes. Premise 1: As long as the dollar trades inversely to gold, the dollar is doomed. Premise 2: The dollar does trade inversely to gold. Conclusion: The dollar is doomed!